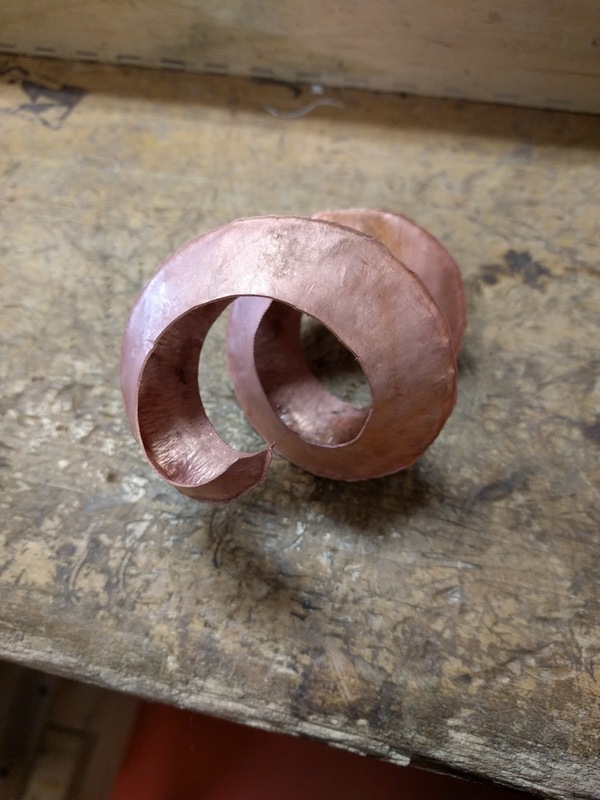 I've recently become interested in forging silver and copper, which is basically the process of using a hammer to move the metal into the form you want. 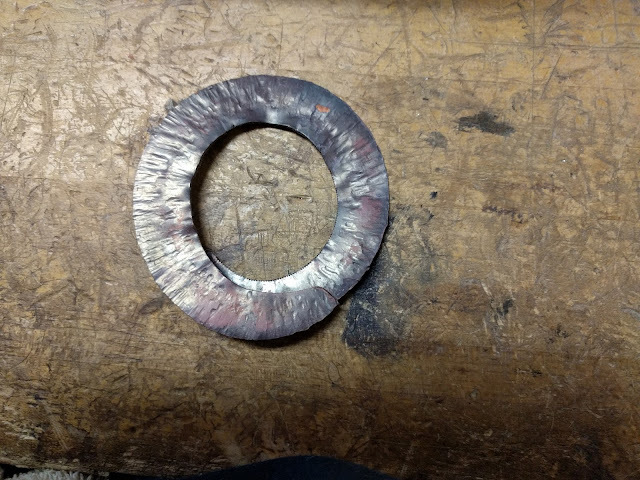 At some point I'll be wanting to do things like make bowls from a single sheet of silver but I need to perfect my hammering technique before I get on with something like that. You'd think hammering metal would be easy but there's all sorts of things to consider like ergonomics including how to sit and how to hold the hammer (especially important for me because of the tendonitis in both my wrists and the lymphedema), how to control the amount of force in each hammer strike, and how to strike the metal in the right place. 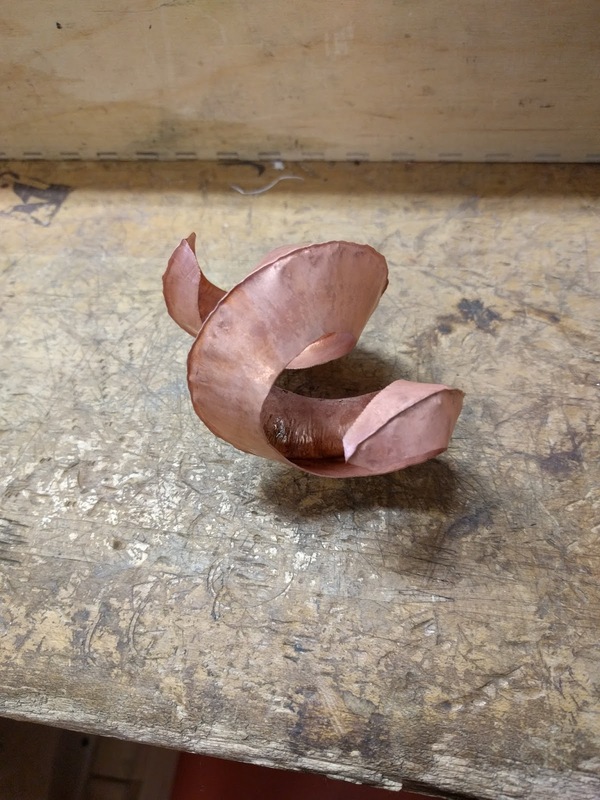 In the meantime, I'm taking a Craftsy class on Foldforming, hosted by the inventor of this method of manipulating metal. It involves folding metal in different ways, hammering part of it, and then opening up the fold to make a unique, nature-inspired piece. Because there's so much hammering involved, I'm getting to practice hammering. 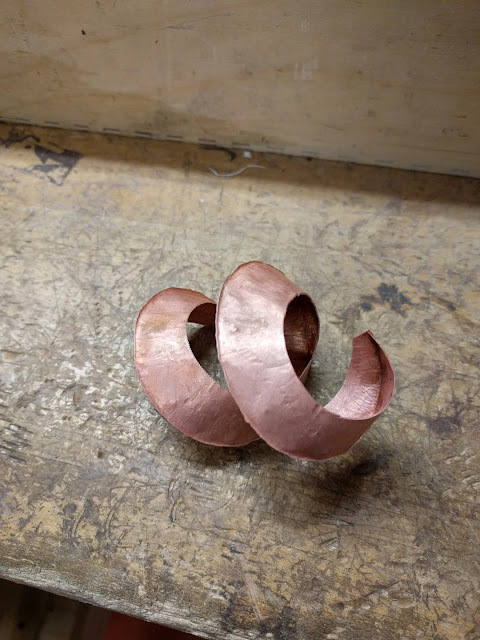 Recently, I made what they call a Rueger fold (here's an example from this online tutorial), and I took some pictures of the process that I thought I'd share with you. These photos came from my phone and are uncropped because I'm super-lazy. See the pictures after the jump. This is the piece before I started hammering. 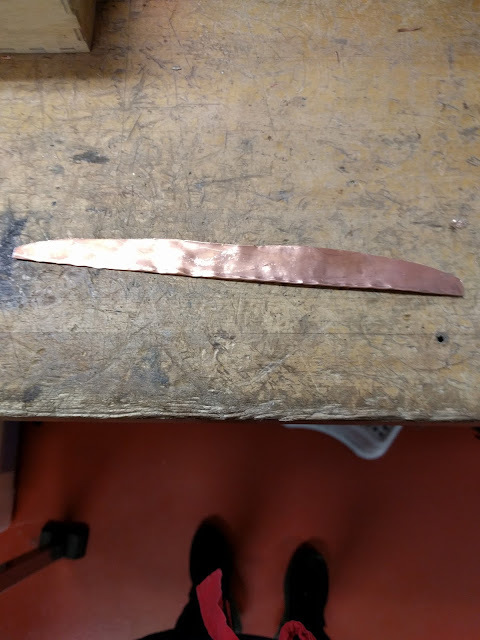 It was a 7" long by 2" wide by 24g (0.5mm) thick copper that was folded in half lengthwise, the fold lightly hammered down to make the piece flat, and the piece trimmed. The fold is at the bottom and this trimmed piece is about 6 1/2" long by 3/4" wide. I just trimmed it with shears. 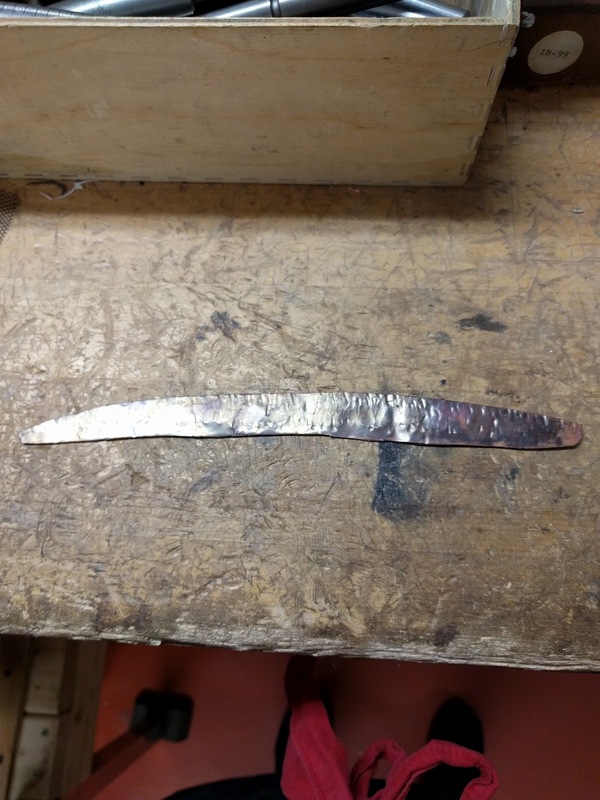 Here's I've hammered the folded edge (which is at the top this time) on both sides with something like a narrow cross-peen hammer (actually this one which has a different name). A cross-peen hammer has a narrow, rectangular face and I'm striking the metal so that the face is perpendicular to the folded edge.You can see that the piece is not quite as straight as it was before and that it's started to curve downwards. You can also see that I didn't hammer this very well; the hammer marks are supposed to all be in the lengthwise half closest to the fold. Now it's really starting to curve. What's happening is that as I strike the folded edge with this narrow cross-peen hammer, the metal splays sideways away from the hammer face. 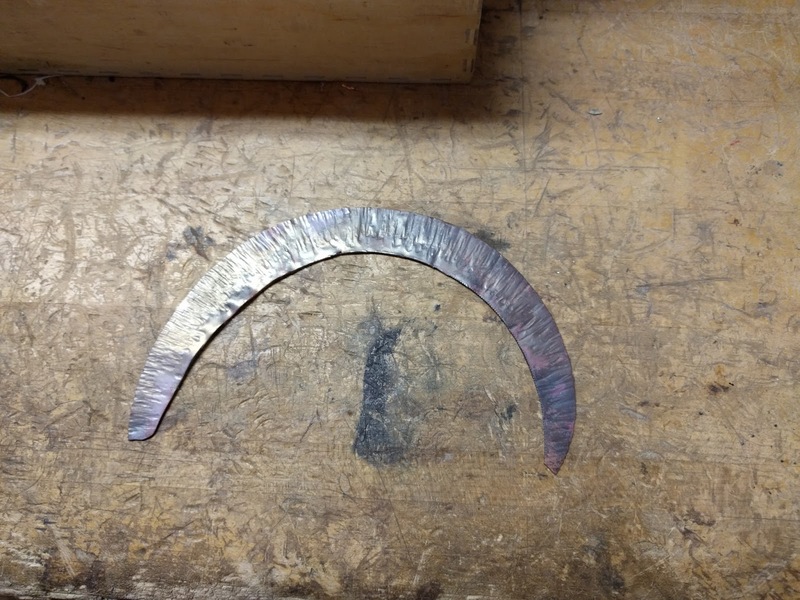 This makes the hammered edge longer than the unhammered edge, forcing the piece to curve. It's quite amazing, isn't it? If I was making a bracelet cuff, I'd have stopped here. Opening it at this point would have given me a cuff that, once open, would have been about 1 1/2" wide, with a ridge in the center, and that would have wrapped around the wrist. Apparently by opening the open edges and adding curvature there, the curvature of the folded edge increases and it makes a nice cuff. This is a good example (from the same online tutorial as above). And this is the final form. You can see that the ends overlap, which made hammering a little tricky. 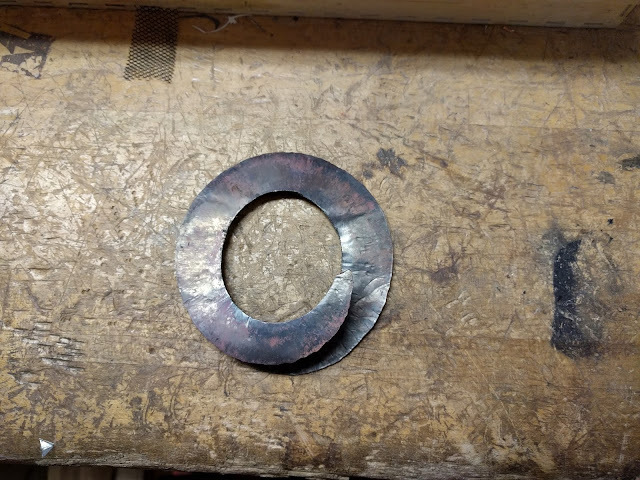 I decided it would be neat to smooth out the hammer marks in a technique called planishing. You use a planishing hammer which has two faces: a slightly domed one and a flat one. The flat one left those marks in the lower right quarter but the slightly domed one smoothed out those hammer marks really nicely, don't you think? And here's the piece opened and pickled (soaked in a warm, weak acid to clean up the metal). Because the curve was so pronounced in the flat form, it makes a spiral when opened. Another view of the unfolded piece. Interestingly, you can see the hammer texture on the inside of the spiral. Isn't it pretty? The final view of the opened piece, where the hammer texture is a bit clearer. I'm very pleased with the final results. I have no actual use for this piece but it's fun to play with it, and by the end my hammering improved quite a lot. I'm looking forward to trying out the next lesson. I'm also ordering some hammers of my own. The hammer I used belongs to my metalsmithing instructor and it's good but I want my own hammers. 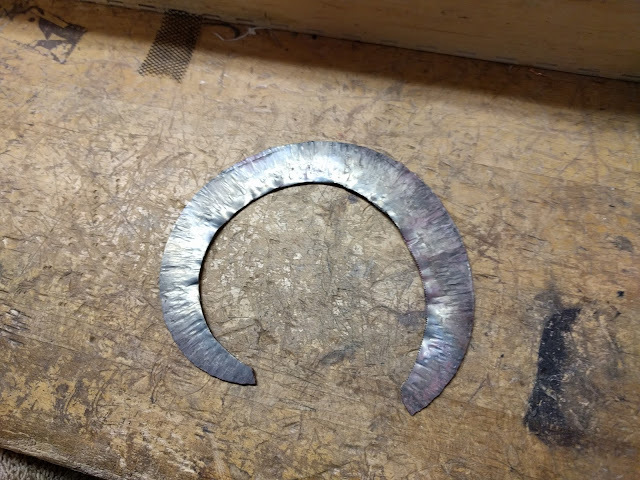 When those hammers arrive I've got another forging project to try that's in one of my books: the Forged Bangle (project #1) in Professional Jewelry Making by Alan Revere. Can you string it up outside and watch it twirl around in the wind? Yep, that's definitely a possibility. Then it would turn green (or black, in Alberta).